Drug Prices stories at Techdirt. stories filed under: "drug prices"
Over at Quartz, there's a very interesting article about how patents may have contributed to the opioid crisis in the US. It's based on a recent paper, May Your Drug Price Be Ever Green, by law professor Robin Feldman (who has done lots of great work about problems in our patent system) and law student Connie Wang. For many years, we've written about how the pharmaceutical industry has become so overly reliant on patents for their business model, that's it's become destructive. We've argued that the misaligned incentives of the patent system, especially in pharmaceuticals has so distorted incentives that the big drug companies basically have become focused solely on keeping exclusivity that it has lead to a lot of tragic game playing, where the cost has literally been people's lives. This went into overdrive a decade or so ago when big pharma realized that many of their biggest sellers had patents expiring, and their pipeline had failed to come up with new drugs to replace the monopoly rents of the old. This resulted in all sorts of gamesmanship designed to allow big pharma to retain monopoly rights even after a drug should have gone off patent. This included pay for delay schemes, whereby big pharma effectively paid off generic makers to keep them out of the market for longer. And then there's the trick of making basically the same drug, but with just a slight, non-essential change, and getting a patent on the new drug. Of course, you might wonder why that would stop people from moving to generics. There are all sorts of games played over this, including misrepresenting the "new" drug as somehow better, or even tarnishing the reputation of the old drug for no other reason than to drive people to the new one. Or, a really nefarious trick: stop selling the older drug a little while before it's gone off patent, to effectively force patients who need it onto the new drug, making it much less likely they'll go to the generic copy of the old drug, since there's a big gap in when it was available. Another trick is Big Pharma threatening doctors for prescribing generics. This study examines all drugs on the market between 2005 and 2015, identifying and analyzing every instance in which the company added new patents or exclusivities. The results show a startling departure from the classic conceptualization of intellectual property protection for pharmaceuticals. Key results include: 1) Rather than creating new medicines, pharmaceutical companies are recycling and repurposing old ones. Every year, at least 74% of the drugs associated with new patents in the FDA’s records were not new drugs coming on the market, but existing drugs; 2) Adding new patents and exclusivities to extend the protection cliff is particularly pronounced among blockbuster drugs. Of the roughly 100 best-selling drugs, almost 80% extended their protection at least once, with almost 50% extending the protection cliff more than once; 3) Once a company starts down this road, there is a tendency to keep returning to the well. Looking at the full group, 80% of those who added protections added more than one, with some becoming serial offenders; 4) The problem is growing across time. The company is still profiting off “abuse-deterrent” OxyContin. Though there are currently “authorized generics” of OxyContin available, these are made by manufacturers with licenses to use Purdue’s formula. In other words, Purdue makes money off them. And there are currently no approved abuse-deterrent generics in the US. In September of this year, FDA commissioner Scott Gottlieb said that soon the agency plans to issue guidelines to assist companies who are trying to file applications for these types of generics. No word on when that document will be published, however. Obviously, this is not the sole reason -- or perhaps even a major reason -- behind the opioid crisis. But it has clearly contributed to it. Purdue Pharma certainly deserves much of the blame for everything its done. And it took doctors way too long to realize the problems and risks of these drugs. But the artificially inflated prices of OxyContin, driven not just by patents, but by the games played by Purdue and other pharma companies, certainly helped keep the prices ridiculously high, often driving people to heroin or other, even more dangerous opioids. White House Plan To Reduce Drug Prices... Is To EXTEND Patents? While Congress is still doing its thing to try to make the US healthcare system an even bigger laughingstock around the world, the White House is apparently considering an executive order targeting high drug prices. Of course, it handed this power over to Joe Grogan, a (very recent) former lobbyist for a giant pharma company, Gilead, that has been at the center of some controversy over its highly priced drugs. Grogan is apparently leading this effort despite not having an ethics waiver, which means he's supposed to recuse himself from these discussions, rather than lead them. But, you know, that's not happening in the swampy, swampy waters of Washington DC. So just what would Grogan suggest as a way to lower drug prices? How about extending pharmaceutical patents? Yes. Extending. The documents reveal behind-the-scenes discussions influenced by the pharmaceutical industry. Joe Grogan, associate director of health programs for the Office of Management and Budget (OMB), has led the group. Until March, Grogan served as a lobbyist for Gilead Sciences, the pharmaceutical company that priced its hepatitis C drugs at $1,000 per pill. To solve the crisis of high drug prices, the group discussed strengthening the monopoly rights of pharmaceuticals overseas, ending discounts for low-income hospitals and accelerating drug approvals by the Food and Drug Administration. The White House declined to comment on the working group. In what world does anyone with even the slightest economic knowledge think that extending/expanding monopoly powers would bring prices down rather than up? Want to know one of the reasons why drugs are so crazy expensive right now? It's because those monopoly rights have already gone way too far. If you want lower prices, you want competition in the market, not monopoly suppliers who know they're dealing with major health issues -- and the willingness of insurance companies to pay through the nose. Except, raise your hand if you think that drug companies would voluntarily lower drug prices in the US, just because they can now also price gouge sick people in other countries? Yeah, didn't think so. If you want to lower drug prices, the way to do it is to cut back the monopoly powers of Big Pharma so that they're actually forced to compete more. This isn't a theoretical or academic claim. Just look at the price of drugs after one goes off patent. They immediately drop. Want cheaper drugs? Ditch the patents and watch the market do its thing. There are currently about 387 million people worldwide living with diabetes. Meanwhile, as discussed by Jeremy A. Greene and Kevin R. Riggs in their March 2015 article in the New England Journal of Medicine, there is no generic insulin available on the market despite great demand in poorer communities and regions of the world. As a result, many go without insulin and suffer complications including blindness, cardiovascular disease, amputations, nerve and kidney damage, and even death. Pharmaceutical companies patent small modifications to previous insulins while withdrawing those previous versions from the market to keep prices up. A team of biohackers is developing the first open source protocol to produce insulin simply and economically. Our work may serve as a basis for generic production of this life-saving drug and provide a firmer foundation for continued research into improved versions of insulin. Since there are no generic versions available in the United States, insulin is very expensive -- that cost was likely a large proportion of the $176 billion in medical expenditures incurred by diabetes patients in 2012 alone. All protocols we develop and discoveries generated by our research will be freely available in the public domain. We will also be proactively investigating strategies to protect the open status of our work. "I don't think the major hurdle is that the companies don't know how to make insulin, because that part is reasonably straightforward," he says. "The real hurdles are getting the drug approved by the FDA (and since insulin is a biologic drug, it requires a lot more original data than an application for a small-molecule generic would), and then upfront manufacturing costs (because making a biologic drug is different, so it requires different equipment)." He suspects that it will take "an altruistic entity with a lot of start-up money" to make generic insulin commercially available. That may be so, but at least the Open Insulin project is doing something in an attempt to change the status quo that sees huge numbers of people suffering unnecessarily. In any case, Open Insulin is a wonderful demonstration of how much biohacking has advanced, allowing suitably-skilled people to make potentially important contributions to global health. Let's hope it does eventually lead to a generic insulin that can be made available around the world very cheaply. With the conclusion of the negotiations for the Trans Pacific Partnership (TPP) agreement now in place, there has been some ridiculous whining from the pharmaceutical industry which got almost everything it wanted in the agreement, but wasn't quite able to get a few things, including a 12 year patent-like exclusivity on biologics. And, because of that hissy fit, apparently, the USTR and its counterparts in Australia and Canada have agreed to help out Big Pharma in another arena. Jamie Love is reporting that this week there's a meeting at the WTO this week to explore granting a special exemption on patent rules for developing nations (i.e., those who often need drugs the most, while also being the least likely to be able to afford them). It's silly to enforce patents in these countries, because doing so would not only lead to almost no business at all, but (more importantly) because lots of people will die or, at the very least, suffer needlessly. On Friday, 9 October 2015, Ambassador Punke met with representatives from 15 countries (including 5 Ambassadors) from the LDC Group. Ambassador Punke clearly indicated that the US could not agree on an indefinite exemption because certain stakeholders in the United States were quite upset with concessions made by USTR during the final stages of the Trans-Pacific Partnership (TPP). Informed sources noted that the US indicated that "the TPP did not deliver as expected on IP and so we are under a lot of pressure not to give in more on IP." How far the pharma industry has come from the days when George Merck declared: "We try never to forget that medicine is for the people. It is not for the profits. The profits follow, and if we have remembered that, they have never failed to appear. The better we have remembered it, the larger they have been." And, really, how do the folks who work at the USTR sleep at night knowing that they're doing this for no reason other than to help out the profits of a few giant companies at the expense of the public? After negotiators failed to complete negotiations on the Trans Pacific Partnership (TPP) agreement a few months ago in Maui, there was some concern as to whether or not they'd ever be able to finish the agreement. They called a special negotiating session in Atlanta that began last week, and was supposed to last just a few days to "iron out the details." Except that got extended. And then extended again. And after promises of an announcement last night, they apparently brought in boxes of pizza and told reporters they were going to pull an all nighter to complete the agreement. Because, of course, when trying to complete an agreement that could reshape global norms on investment, regulations, intellectual property and a little bit of trade... staying up all night sounds like a grand idea. And just like you after staying up all night before your college finals, negotiators think that this all-nighter worked. This morning they announced a final deal. But also that it won't be public for maybe a month or so. And then there will be some debate over it, but thanks to Congress caving in on fast track authority, Congress has almost no ability to point out flaws in the agreement. They can only give it a clean yes or no vote. In the announcement, negotiators (not surprisingly) played up all the tariffs that will be wiped out by this agreement. That's the one part that I'm fine with. Trade tariffs are a mostly bad idea, and getting rid of them is fine. But the TPP is not about trade. That's just a pretext. The key parts are really about regulations and investment. Indeed, two of the big sticking points concerning patent-like exclusive rights on certain new pharmaceutical compounds ("biologics"), where the US was pushing for at least 12-year exclusivity periods to drive up the price of drugs around the globe, while Australia and other countries were pushing for five years. It sounds like there was a compromise that allows for a range from five to eight years, but, again, who the hell knows until we see the details. At the press conference, negotiators refused to give any details, other than suggesting they came up with text that pretends to satisfy everyone. That is, officially it's five years but there are "other regulations" that bring things closer to the US's demanded 12 years. Another point of contention was on the infamous corporate sovereignty provision, officially called "investor state dispute settlement" (ISDS), which is a boring sounding name for saying that foreign companies can take entire countries to special tribunals if they feel that new regulations in those countries negatively impact profits. These tribunals are a joke and put corporate interests over sovereign country interests. The one real "compromise" here is that the agreement apparently excludes tobacco companies. As we've noted a few times in the past, tobacco companies have used these corporate sovereignty provisions in other trade agreements to sue countries that pass anti-smoking laws of any kind. Last year, the US floated this compromise idea, that if tobacco companies were excluded, the rest of ISDS would remain in place. And it sounds like that's what happened. Either way, at some point the final text will be revealed and then there will be lots of shouting and screaming, but rest assured that the USTR and the Obama administration are going to fight like crazy to get this approved, because they (very stupidly) see this as part of Obama's "legacy." The compromises may make things a bit more difficult, because the compromises on pharmaceuticals and tobacco will piss off two of the biggest lobbyists in support of the agreement. From the sound of things, the rest of the intellectual property chapter hasn't changed much since the May version leaked. It's unclear if the USTR ever did push for clearer fair use provisions as was rumored. Chances are they're not in there, but, again, we won't know for a bit, because... "secret trade deal." And, really, the most sickening part in all of this, beyond the efforts to increase drug prices globally, beyond the efforts to extend copyright terms, beyond the efforts to limit fair use, beyond the efforts to give companies corporate sovereignty over nations... is the ridiculous willingness of the US government to look the other way on human trafficking/slave labor. As you may recall, part of the fast track authority was that this agreement could not include countries designated as human trafficking hot spots. Malaysia, one of the negotiating countries was included in that list. But, no problem, the State Department, for purely political purposes, upgraded Malaysia, even though the country has shown no improvement at all, and just two months earlier police had found 139 mass graves found along a path where migrant workers had been trafficked. What a "legacy" for President Obama: "compromising" in a way that helps big companies sue countries that pass bad legislation, drive up the price of drugs, decrease access to culture... and look the other way on human trafficking. And now it's a "done" deal. A U.S. drug company is taking the Canadian government to court for its attempt to lower the price of what has been called the world's most expensive drug. Alexion Pharmaceuticals has filed a motion in Federal Court, arguing that Canada's drug price watchdog has no authority to force the company to lower its price for Soliris. According to the article, a 12-month course of Soliris costs about $520,000 in Canada at today's exchange rates, and a mere $500,000 in the US. While Soliris is not a cure, it can stop the assault [by two rare blood diseases] on the body's tissues and organs. Since patients typically need to take the medication indefinitely, it can cost tens of millions of dollars over a lifetime. Due to the high cost, some patients in Canada can't get the drug. Only some provinces will cover the cost of treatment and there are different criteria to qualify for coverage in various jurisdictions. In case of Soliris, most of the research and development was done by university researchers working in academic laboratories supported by public funds. "I think the public science is well over 80 or 90 per cent of the work," said Sachdev Sidhu, a University of Toronto scientist who is also in the business of drug development. A University of Ottawa professor who specializes in health law said he was shocked that Alexion would challenge Canada's authority to regulate drug prices. If Alexion's case is successful, it could end Ottawa's ability to control the cost of patented drugs, Amir Attaran told CBC News. "This is the single greatest threat to pricing of drugs in Canada ever," he said Thursday. In the pursuit of high profit margins, the world's dysfunctional drug industry continues to ride roughshod over everything in its path, whether a patient trying to survive a rare chronic disease, or an entire nation trying to provide decent medical treatment to as many of its population as possible. Martin Shkreli -- who became the personification of a deeply-reviled industry thanks to his insanely-exorbitant price hike on a 60-year old drug -- has heard the disapproving roar of the crowd and will do… something… at some point in the future… to make things right. Or at least a bit more right-ish. In an interview with ABC, Shkreli announced Daraprim's $750/pill price will be rolled back to something less extortionate. Turing's mini-debacle has damaged the pharmaceutical industry. It has drawn even more heat from legislators and presidential candidates. It has even negatively affected more tangible aspects, like stock prices. Shkreli's actions have also drawn attention to the oft-ignored regulatory procedures that allow companies to fully exploit old drugs and medications, even without the protective power of active patents. Derek Lowe at Science Magazine explains the route to securing post-patent monopolies. By various means, old generic compounds have ended up as protected species, and several companies have made it their business to take advantage of these situations to the maximum extent possible. The FDA grants market exclusivity to companies that are willing to take “grandfathered” compounds into compliance with their current regulatory framework, and that’s led to some ridiculous situations with drugs like colchicine and progesterone. (Perhaps the worst example is a company that’s using this technique to get ahold of a drug that’s currently being provided at no charge whatsoever). Combine this with the bottleneck Turing generously refers to as "distribution" (via a single specialty pharmacy or directly from Turing itself) and you have everything you need to demand any amount you want for a lifesaving drug with a limited market. Everything being said about R&D investment is just smoke until proven otherwise. Following his short statements promising unquantified price drops at an unspecified point in the future, Martin Shkreli -- who seemed to relish praising himself/insulting his detractors from this social media platform -- took his Twitter ball and went home. Turns out the market will bear far less than Turing thought, even with the benefits of a tightly-controlled distribution chain and the FDA's assistance in keeping competitors off the playing field. A whole lot of people who will never use the drug managed to nudge the price downward, and all within 48 hours. Martin Shkreli -- founder of Turing Pharmaceuticals and overnight poster boy for everything that is wrong with the pharmaceutical industry -- spent a lot of yesterday defending his 5000% price hike on Daraprim, a drug that treats victims of toxoplasmosis. That the drug has a nexus with cancer and AIDS sufferers (basically anyone with a diminished immune system) made the price increase seem even more unconscionable. Shkreli's self-serving interviews were loaded with ridiculous statements. He claimed raising the price from $13.50/pill to $750/pill was done in the interest of the same people who would likely find it suddenly prohibitively expensive to take the drug. First off, there's no consensus that the medical community is searching for a new toxoplasmosis drug. Dr. Wendy Armstrong, professor of infectious diseases at Emory University, questions Turing’s claim that, after more than 60 years of physicians using Daraprim, there is a need for a better version of the drug. “I certainly don’t think this is one of those diseases where we have been clamoring for better therapies,” says Armstrong. Next, there's the inherent ridiculousness of this assertion, which portrays Turing's plans for Daraprim as a reverse pyramid scheme, in which future "investors" will benefit from the gouging of those who got in on the ground floor. On top of that, Shkreli claims the drug is still underpriced, despite having been sold for $1/pill before its acquisition by the company Turing acquired it from. While it's true that drug research and development can be expensive, it is nowhere near as costly as this price hike would indicate. Shkreli tossed out the easily-debunked claim that it costs $1 billion to bring a new drug to market. The actual cost is considerably lower (~$55 million), according to research using the same data drug companies provided to backup their claims of $1.3 billion in R&D costs per new drug. Data also shows pharmaceutical companies spend far more on marketing than research and development. They have to. Most "new" products on the market aren't actually new. They're just variants on what's already available. It's tough to sell a "new" drug that doesn't outperform a competing product, hence the increased marketing expenditures. Shkreli also used a variant of "everyone else is doing it" to defend the price jump. He pointed to the existence of other cancer drugs costing "over $100,000" per treatment as justifying Turing's price increase. But being slightly less exortionate than competitors isn't the same thing as being "good." Shkreli has little interest in being good, no matter what altruistic assertions he makes. His former company -- from which he was ousted over accusations of stock price manipulation -- also jacked up the price on an essential drug just because it could. When Retrophin acquired rights to Thiola, the drug cost about $1.50 per pill. [Patients take multiple pills per day.] Now, Retrophin has decided to charge more than $30 for the same Thiola pill. Retrophin says it has plans to change the Thiola dose and develop an extended release version of the drug, but I have seen none of those changes yet. To my knowledge, Retrophin hasn't yet done any of this work -- except to drastically increase Thiola's price. And indeed, Retrophin never did. 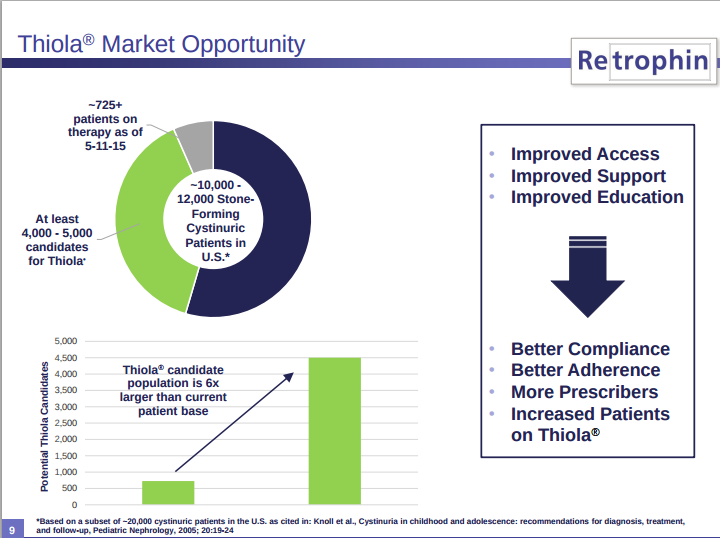 From a 2015 presentation, it's generating sales for Retrophin, but nowhere in it is any indication the company is actually working towards an extended-release version of the drug. I asked Shkreli about this and he claimed the company ditched the R&D plans after it ousted him. Maybe this is true, but it doesn't exactly instill any confidence in Shkreli's latest claims that price hikes are being done with an eye on increased R&D spending. Instead, they look like nothing more than the normal deflection performed by drug companies after controversial price increases. Other circumstantial evidence does little for consumer confidence. Not only is Shkreli being sued by his former company for fraudulent behavior, he's previously been taken to court (by Lehman Brothers) for a $2.3 million loss he incurred (but never repaid) when his bet on a market decline went south. The complaint accuses him not only of failing to pay Lehman what was owed, but of pushing through the transaction without actually possessing the funds to cover the original purchase. Shkreli also has a history of thriving on market failure. He has made money shorting pharmaceutical stocks while simultaneously engaging in questionable behavior. Here's a "treatise" he wrote detailing the negative aspects of one company's research efforts, which clearly states at the top of each page (for legal reasons) that he stands to personally gain if the company's stock price drops. DISCLAIMER: The authors of this article have a conflict of interest and will benefit financially if the stock price of VTL falls. The authors reserve the right to change their investment if the price of VTL changes dramatically. Please read the Disclosure at the end of this paper for more information. But he's also been accused of actions that are more than simply treading the edge of legality. 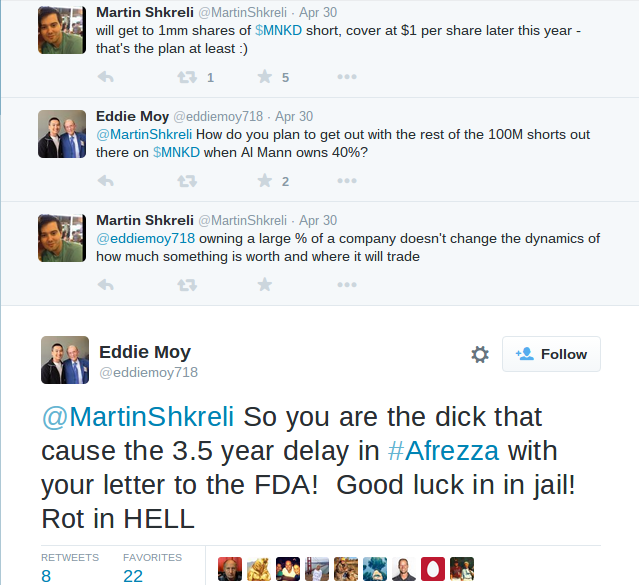 A heated Twitter exchange implies Shkreli talked the FDA out of a drug approval -- something that hurt the company producing the drug, but paid off for Shkreli's stock short. Shkreli's history does little to back up his assertions of altruistic goals and a future full of well-funded research and development. Instead, it shows someone who's willing to exploit every last dollar out of something and leave its dessicated corpse behind. What he has done is anger the "community" he's a part of. Drug prices were already being subjected to the scrutiny of crusading legislators. Now, drug prices are no longer under the Congressional microscope. They're also being projected onto the Jumbotron that is social media. No less than presidential candidate Hillary Clinton offered up her view on the price hike, promising a plan to address the problem. On top of that, share prices for several drug companies fell the day the Daraprim price hike went viral. That this may have worked out well for Shkreli can't be ignored, considering his prior experience with shorting pharmaceutical companies. Maybe this was part of the plan: Short pharma stocks. Jack price up on newly-acquired drugs. Play the villain while cashing in on the market decline. That's all speculation, of course. What is certain is that Martin Shkreli is not THE problem. (He's not even "Big Pharma," even though several editorials have placed him in this group.) He's part of the problem, but his specific actions are more about exploiting obscure drugs that competitors aren't interested in. His actions shed little light on the genesis of high drug prices. But it's patents that make drugs unaffordable in the first place. New drugs are given, at minimum, 20 years of competition-free sales. That's two decades (at least) where drug companies can charge whatever they want because no one else can offer a competing product. Companies -- like Shkreli -- will claim they need this exclusivity to recoup "massive" research and development costs. But this simply isn't true. Pharmaceutical companies enjoy massive profit margins, much more than would be expected if they were faced with meaningful competition. The lie is exposed when patents expire. Prices fall dramatically once the market is opened, including that of the original manufacturer's. So, if the government really wants to tackle the problem of overpriced drugs, it needs to start with the protections it grants that allow this to happen. But this seems unlikely to happen because drug companies have significant "buying power" when it comes to legislation, no matter how many people come forward to testify about being priced out of essential treatments. Shkreli, however, is specializing in finding "orphan drugs" -- drugs for rare conditions that are no longer under patent protection (which would raise the acquisition price significantly) but which have seen little to no competitive movement over the years. His decision to implement a 5000% price increase, despite minimal costs (and benefiting from R&D performed 60 years ago), is one he can make because there's no market force in place to stop him. So, he may be the poster boy for everything that's wrong with the pharmaceutical industry, but he's not really indicative of the ongoing problem. What he is, however, is an opportunist with a hedge fund background and a history of market exploitation. Any claims of altruism or searches for better treatments should be met with intense skepticism. When pharmaceutical companies defend outrageously-priced medicines, they often claim these massive profit margins are there to help them recoup the money dumped into research and development. But that has nothing to do with the high prices. R&D costs are consistently lower than companies portray them. The real reason for exorbitant drug prices is a monopoly granted by patents, which lock out all competitors for years. And when the patent nears expiration, pharma companies extend their monopoly by doing questionable things -- like testing high-powered, opiate-based painkillers on children -- just to extend the patent protection for another few months. Turing Pharmaceuticals of New York raised the price of Daraprim from $13.50 per pill to $750 per pill last month, shortly after purchasing the rights to the drug from Impax Laboratories. Turing has exclusive rights to market Daraprim (pyrimethamine), on the market since 1953. Daraprim fights toxoplasmosis, the second most common food-borne disease, which can easily infect people whose immune systems have been weakened by AIDS, chemotherapy or even pregnancy, according to the Centers for Disease Control. In this case, any research and marketing costs have long since been recouped (or at least amortized). The patents behind the drug -- all granted between 1951 and 1954 -- should be dead. Conveniently for Turing (and other rights holders before it), no company is offering a generic version. Every time the drug has changed hands (and it's done it more than once), the price has gone up. But no other company has increased the price quite as much as Turing Pharmaceuticals has. Perhaps that's because Turing spent a significant amount of money to acquire an exclusive marketing license, but with none of the attendant patent exclusivity. Impax Laboratories, Inc. (NASDAQ: IPXL) today announced that it has sold its U.S. rights to the Daraprim brand to Turing Pharmaceuticals AG for approximately $55 million. Turing, of course, realizes this price jump -- which puts one month's supply in the new vehicle range ($45-50,000) at minimum -- is going to be tough on those expected to pay for it, but claims to have support in place to help absorb some of the ridiculous increase. A Turing spokesman, Craig Rothenberg, said the company is working with hospitals and providers to get every patient covered. This includes free-of-charge options for uninsured patients and co-pay assistance programs. For inpatient procurement, institutions can no longer order from their general wholesaler. Instead, they must set up an account with the Daraprim Direct program. Once enrolled, orders may be placed with the company until 6 pm Monday through Friday and will be delivered the next business weekday, because there is no weekend delivery at this time. For outpatient procurement, patients can no longer obtain the medication from their community pharmacy. All prescriptions must be transmitted to a single dispensing pharmacy: Walgreens Specialty Pharmacy. Upon insurance verification and co-pay collection, the prescription will be mailed to the patient’s home, and most prescriptions can be mailed overnight. This presents a problem for hospitals. Although the drug is low-use (it combats the effects of toxoplasmosis -- something that can cause serious issues for those with weakened immune systems, like cancer/HIV patients), it still is needed often enough that the two access routes just aren't enough. My institution recently encountered a difficult scenario in which pyrimethamine was attempted to be obtained through the Walgreens Specialty Pharmacy. The patient in question was currently homeless, and therefore did not have a home or address to which the medication could be delivered. Additionally, the manufacturer did not yet have a system in place to address the situation. This could have been extremely problematic, but fortunately, my institution is affiliated with a Walgreens Specialty Pharmacy and contracted to provide bedside delivery to patients prior to discharge. The patient was able to receive the pyrimethamine as an inpatient. Turing, of course, defends the increased price by claiming the exorbitant profit margin will result in increased R&D. But let's take a closer look at what its spokesman is actually saying. Rothenberg defended Daraprim's price, saying that the company will use the money it makes from sales to further research treatments for toxoplasmosis. Translation: this money will be dumped into finding another variation to patent, thus locking out potential competitors and allowing Turing to continue charging whatever it wants for the medication. They also plan to invest in marketing and education tools to make people more aware of the disease. Translation: we will market the hell out of this new drug. This sort of thing isn't exclusive to Turing. It's standard MO for all pharmaceutical companies. Rather than engage in meaningful competition, these companies are awarded lengthy monopolies on drugs and treatments by the US government. Turing is no different than Amedra -- part of the holding company acquired by Turing along with the Daraprim rights. But when Amedra acquired the rights from GlaxoSmithKline, it somehow managed to keep its price hike to a couple of dollars, rather than several hundred. This huge price jump has more to do with the man running Turing, Martin Shkreli. Shkreli doesn't have a background in pharmaceuticals, but he does know how to run a hedge fund. And he's used this expertise to become highly-unpopular very quickly. Since founding Turing last year, Shkreli has taken a page from what made Retrophin a high-profile--and controversial--player among small biotech companies. Retrophin's stated goal was ferreting out value in biopharma by acquiring assets with potential in rare and neglected diseases, a process that can mean acquiring an underused drug and jacking up its cost to take advantage of rare disease pricing. Here's one of the moves Shkreli made as the head of Retrophin. In September 2014 Retrophin acquired the rights to thiola, a drug used to treat the rare disease cystinuria. It was with Shkreli as CEO that Retrophin introduced a 20-fold price increase for Thiola, despite no additional research and development costs incurred by obtaining these rights. Turing is basically Retrophin 2.0, or more accurately, Shkreli being Shkreli. Shkreli may have still been helming Retrophin at this point, had his own company not ousted him. In August, his former company also sued him, alleging financial impropriety. It appears that Shkreli is a bit too comfortable operating in gray areas. The market-related shadiness alleged in the lawsuit appears to be just part of Shkreli's everyday business affairs. In an uncommon move, Shkreli himself led the Series A financing, and Turing isn't naming any of its other backers, calling them "preeminent institutional equity investors" and leaving it at that. In a filing with the SEC last week, Turing counted 34 individual participants in its funding round but reported raising just $62.7 million. This reported total of the funding round didn't match the claimed total ($90 million). Shkreli had an answer for the missing funding. And that answer was "Shut up." A spokesman for the company declined to explain the $27.3 million difference, and further questions about the company's financials were met with a terse email from Shkreli asking FierceBiotech not to contact Turing again. However, if you do feel like discussing the 5000% increase in Daraprim's price, feel free to take your questions to Shkreli himself, who is surprisingly accessible on Twitter. Just know ahead of time that you're too stupid to understand complicated business stuff, you don't represent anyone worth talking to, "everyone else is doing it," and shut up. The unasked question has its answer: why did Turning flip the switch on a 5000% price increase? Because it can. And it's not just the people being prescribed Daraprim that will eat the cost. It will be every customer of every health insurer that covers the rest of the cost of these prescriptions. These additional expenses will eventually result in higher health insurance premiums. And while Turing is offering to help out those with little to no insurance, these costs -- whether they're absorbed by health care institutions or the government itself -- will be passed on to the general public as well.